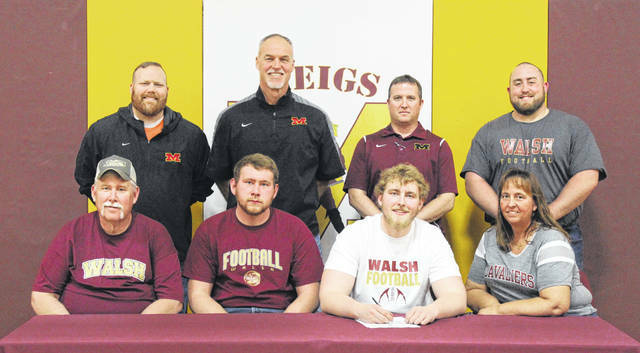 On Friday at Meigs High School, senior Claytin Neutzling signed his National Letter of Intent to join the Walsh football team. Sitting in the front row, from left, are Tim Neutzling, Coltin Neutzling, Claytin Neutzling and Lori Neutzling. Standing in the back row are Alex Saunders, Mike Bartrum, Kevin Musser and Cassady Willford. ROCKSPRINGS, Ohio — Trading in one Maroon and Gold jersey for another. On March 29 in Meigs High School’s Larry R. Morrison Gymnasium, MHS senior Claytin Neutzling signed his National Letter of Intent to join the Walsh University football team. Neutzling — a four-year member of the Marauders varsity team — talked about taking the next step in his football career, and thanked those who have helped him reach this point. In four years with the Marauders, Neutzling has helped the team to an overall 18-22 record, including 13-11 in the Tri-Valley Conference Ohio Division. 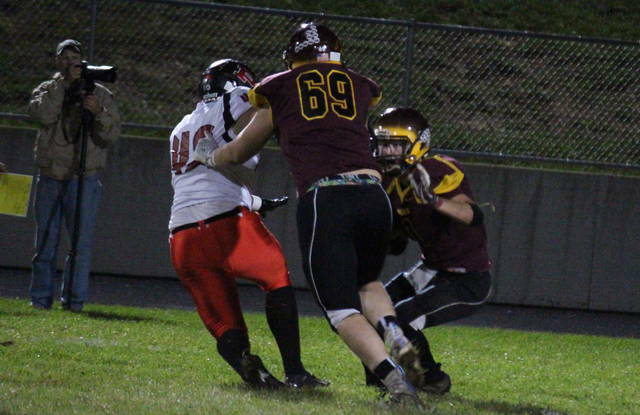 Neutzling was an all-league selection in his senior season, blocking for an MHS offense that generated 128 first downs and 2,850 total years last fall. Former MHS head football coach Mike Bartrum talked about the bond that Neutzling had built with his coaches, as well as what he what he expects from his standout lineman at the next level. “Before he even had his driver’s license we had a bond,” Coach Bartrum said. “Kind of like him and Coach (Cassady) Willford, I know they’ve been working out since football’s been over, and even last year. You build those bonds with those kids. He needed a ride in the morning because Mom and Dad went to work early, so I’d pick him up at 5:45, and we built a really close bond over that offseason two years ago. Neutzling will join Cavaliers squad embarking on its 25th season. Walsh is an NCAA Division II school that competes in the G-MAC and plays its home games at Tom Benson Hall of Fame Stadium. Claytin talked about why Walsh was the right choice for him to continue his academic and football careers. Neutzling, who holds a 3.25 GPA at Meigs, will major in Material Engineering at WU.